A US man has been stabbed in the chest by a stingray which leapt on board his boat in Florida. James Bertakis, 81, was critically ill in hospital after undergoing surgery to remove the stingray's barb. He was brought ashore by his granddaughter and her friend, who were also on the boat, after the attack. Last month, Australian TV naturalist Steve Irwin died when a stingray's barb pierced his heart as he filmed at Queensland's Great Barrier Reef. US officials say they are shocked at the attack on Mr Bertakis. "It was a freak accident," David Donzella, acting fire chief in Mr Bertakis' hometown of Lighthouse Point, was quoted as saying by the Associated Press news agency. "It's very odd that the thing jumped out of the water and stung him. We still can't believe it," he said. Surgeons were able to remove some of the barb from Mr Bertakis' chest. The stingray died on the boat after the attack, officials said. 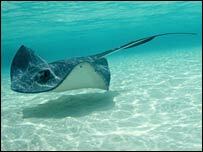 The stingray is a flat, triangular-shaped fish, commonly found in tropical waters. It gets its name from the razor-sharp barb at the end of its tail, coated in toxic venom, which it uses in defence when it feels threatened. Attacks on humans are extremely rare, scientists say.